Some of you have contacted me to ask about The Cisco Kid so I thought it would be a good time to let you know a bit more about the project. The Cisco Kid ran in American newspapers from January 15, 1951 to August 5, 1968 (roughly 17 years) as a daily only. Though the good graces of 4 collectors, I have been lucky enough to gain access to the entire run of the strip in 3 formats - original art, Production Proofs, and clippings. So the books are going to be a mix, using the best available format available for each day's strip. Development of the first book is currently under way and should be available sometime in Spring/Summer of 2010, with plans to reprint the entire run of the strip in roughly 6 volumes, at the rate of 2 per year. A lot of you have asked me why I'm not reprinting Leonard Starr's Mary Perkins On Stage in Hardcover - the answer is quite simple - money. And a couple of you have even asked me about the possibility of a slipcase for the books. I've been thinking a bit more about it and now that I have the series locked down to 15 volumes I feel the best approach is to produce slipcovers for Volumes 1-5, 6-10 and 11-15. I'll be looking into this further in the next couple of months and post more details on the website and this blog as plans come together. I've already discussed this with Leonard and what we plan to do is design a nice end piece for the slipcase related to the volumes in that particular case. We'll do our best to keep the price within reason and though I can't give you an exact date, you can expect to see something by the end of this year. 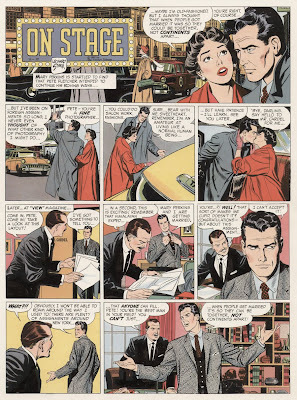 And now for our Strip of the day - One of my favorite Sundays from 1957. Pay attention to what Mary says in the first panel and how Pete echos it in the last. How the meaning changes just by placement of emphasis. One of the countless things I love about this comic strip. Why not the Sundays of "Mary Perkins On Stage" in full, original color? Andoni - right now, the cost of doing color is a bit out of our current budget. Perhaps in the future but right now the overall cost of doing the covers in color would double the price of the books. In volume 5 of "Mary Perkins on Stage", page 64, there are two vignettes repeat, 4 and 8. 4 is certainly wrong. Some kind of troubles in the reception of materials from Chicago Tribune-N.Y. News Syndicate? Any possibilites of other great comic strips like JOHNNY HAZARD, Dan Barry´s FLASH GORDON or MANDRAKE THE MAGICIAN? I ended up on this blog, looking for information. I have ended up with a bunch of official reprints of the Cisco Kid. Maybe a bit yellowed but other than that, in top condition. Just wondering if they're worth anything ? I certainly understand your concern about costs. But could you please consider, when you've completed the run of the series in the current B&W format, putting out a single coffee table size book reprinting some of the "best of" color Sunday strips? I'll bet there might well be enough interest and demand to justify a one-shot deal like that, even if you have to charge $75 or so for it. I cannot wait for Cisco Kid, yeah I love westerns..how about Red Ryder by Fred Hariman! Johnny Hazard is my favorite of all comic strips ever! Especially Sundays. Sundays would fit perfectly in landscape format, except for few initial years which can be skipped anyway,.. best JHaz is from late 50's to early 70s, so those other can be skipped. Thank for you for your hard work on this siteI really appreciate it. Whomever you are be rest assured that in 2010 posts on this blog will not be so haphazard and scattered. I've been working on multiple projects the past couple of months and just did not have the energy to add any new posts. That is about to change!!! Stay tuned! And to all - Happy New Year!! !